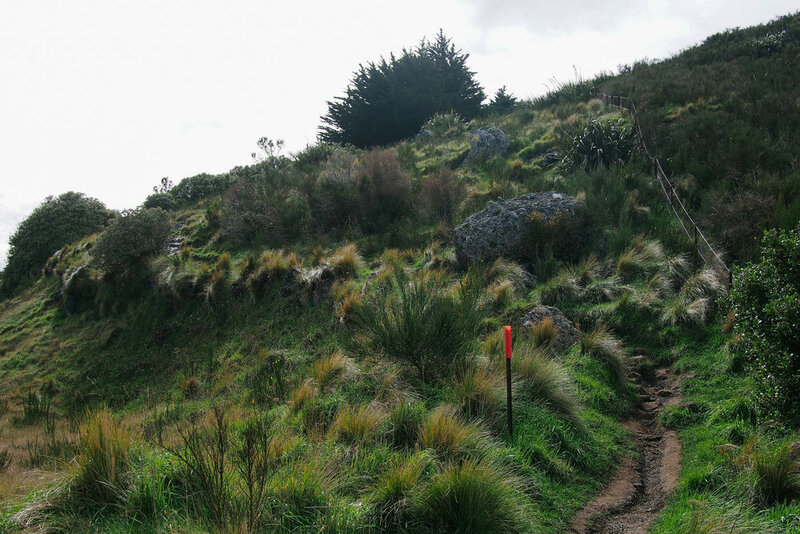 If you harbour a desire to walk the length of the Port Hills, the Crater Rim track is the path you will tread for most, if not all of this journey. 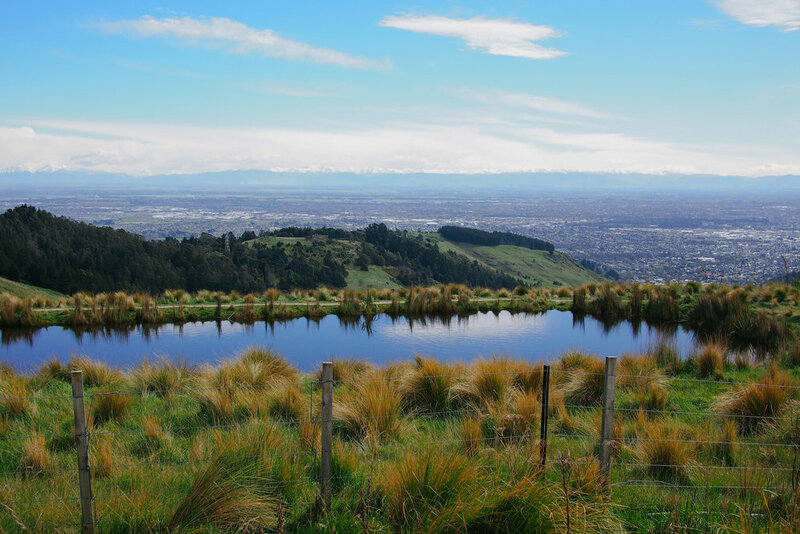 It follows the curves of the hills from Godley Head to Coopers Knob, atop the line of the rolling Port Hills. To walk it in its entirety would be a long walk, to put it mildly, but there are endless permutations of shorter walks which fall in between, creating a veritable jigsaw of tracks to suit all. 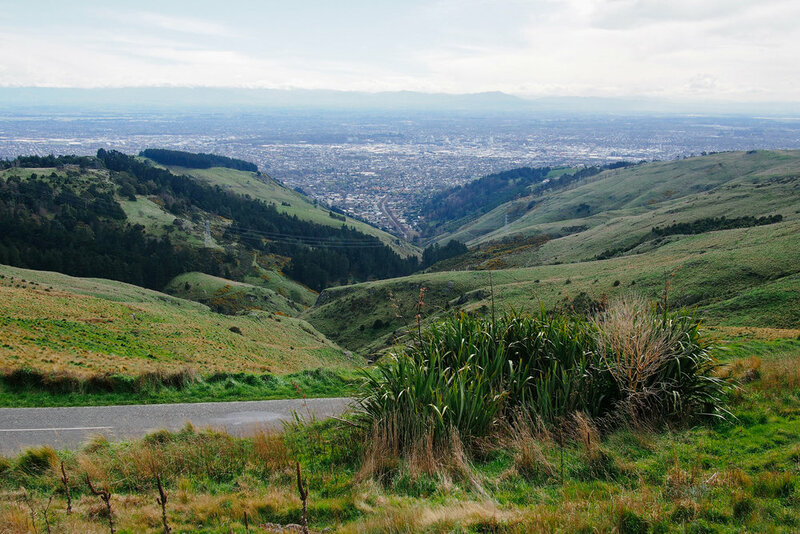 To consider all of these is a bit overwhelming - looking at the twisting map of tracks which snake their way over the Port Hills can leave you with a too-hard-basket sort of feeling. A bird by bird approach is needed, to break down this mammoth walk into manageable sections, which you can then customise at will as they become as familiar as the back of your hand. This particular leg, starts just past the south-western foot of Sugarloaf and carries round a gentle curve round to the Mt Vernon Farm Park. Its a workhorse of a walk - one that could become a regular, with its moderate length and difficulty and well dispersed variations in terrain and setting. 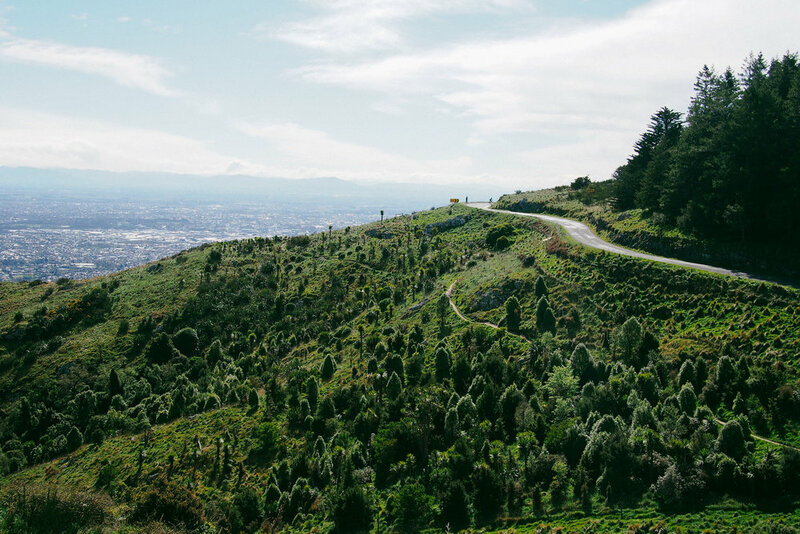 Drive up Dyers Pass Road to Sign of the Kiwi and turn left onto the Summit Road. Follow the road round Sugarloaf and when you are just past it, you will find a small layby on the right-hand side of the road - pull in and park here. The Crater Rim track runs both ways, you want to jump on it and head left (if your back is to the City) - in the direction of Sumner. Follow the track, and turn around when you reach the big sign that says Mt Vernon Farm Park (which is conveniently located at a very picturesque photo spot both over the city and towards Lyttelton. Turn around and retrace your steps to your car. Pretty moderate. It's a good one because its not all up one way and all down the other - its undulating so it's built in interval training. There are short stints which are fairly steep but they aren't prolonged and aren't too taxing. Easily modifiable as you can just keep walking in one direction or the other and turn around as you like - but on the outward journey, the next logical add-on is Mt Vernon, which is a walk in itself, so you'll have to commit or turn around at an illogical spot. The track is clear but has some pretty rough patches, fine for most people but anyone who isn't so surefooted should take care. Some is over rock which is slippery when wet. It also evenly distributes patches of tree cover and open immense views - which keeps it interesting. Its a walk of well distributed features - not extremes. As you are prancing along the top of a hill it can get cold if it's windy, and hot if it's not so layers are your friend. A lot of photos stops were taken (its that kind of walk) so allow some time for that, but its about an hour return. For a longer walk, walk a bit further before turning round or even add on the full Mt Vernon walk. Keep walking to Godley Head if you are really keen - the beauty of the Crater Rim is it's endlessly customisable. Alternatively, when you get back to your car, walk a but further along to, or up, Sugarloaf and back. Very friendly - hellos are delivered with enthusiasm and a smile. Who could be grumpy with those views out both sides. It's not too hard so you don't hit those patches where people may be hating life (i.e. me on any upwards incline) so people seem to be in good spirits (unless they started at Godley Head maybe). No major hazards to speak of, except that it is a hilltop so if you go really rogue you'll find some steep patches which could prove tricky. You have to navigate around discarded KFC packaging at some points. 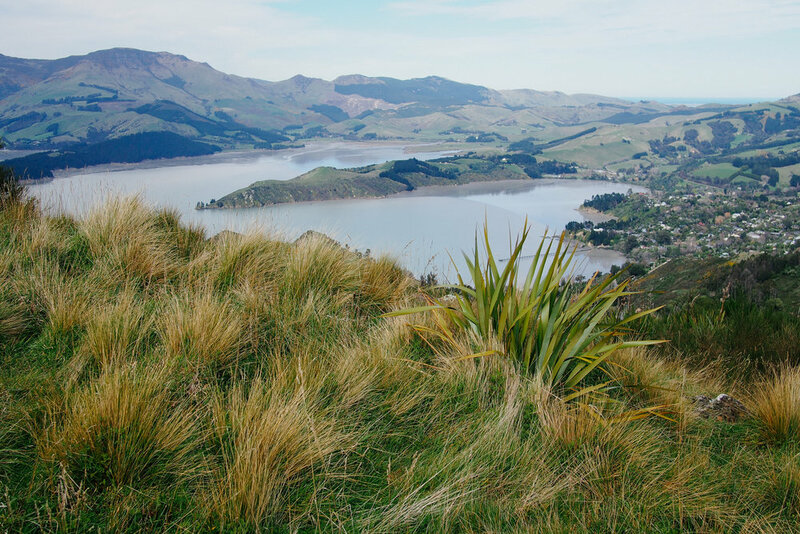 As with any walk on the Port Hills, the views are worth writing home about - both over the City and the Harbour.